“My mom’s an accountant, but I don’t want to rely on her to do my taxes forever.” This is what Shawn Wilson responded with after being asked why he participates in Adulting 101 at Everest Public High School in Redwood City, CA. The senior student is just one example of the many who take this helpful class. Wilson explained his motive for signing up saying, “I thought it would give me useful information that would be applicable to my life after Everest.” The class is a new offer this year at Everest, created after being requested by students. The mock interviews take place at Everest and involve local resources in order to provide a realistic experience to learn how interviews work. Resumes will also be checked and read to provide help. Interview topics discussed in the class included typos in a resume, interests, effort, background and illegal questions. In addition to the realistic questions and analysis, students are also required to dress formal in order to impress whoever is interviewing. This is useful as it gives them a sense of professional visual appearance and its impact. Magana explained that her real interview was on the same day as the mock interview, saying, “I applied for a job, so I’m hoping that the mock interview will help me. I hope that the resume will help me too.” The mock interview involves volunteers coming to the school and acting out very realistic interviews. The teacher of this class, Zoe Marinkovich, said the class was designed after “students asked for help with getting driver’s licenses, jobs and paying taxes, so I tried to build a course that would cover as much of that as possible.” The teacher added that the course was originally just an idea that she believed couldn’t happen due to the diversity of requests. Ms. Marinkovich explained her hopes for the students, saying, “I hope they vote and read the news. I hope they make smart choices about money. I hope they know their rights as employees. I hope they have some confidence that they can figure out adult problems and make good choices.” The course is designed to provide real experiences with volunteers and guest speakers. In response to a question about the age range of students and what students are most interested in Adulting, Ms. Marinkovich speculated, “At first I thought ninth graders wouldn’t be interested, but some of my best, most curious students are ninth graders.” As mentioned previously, freshmen are the second most abundant group in her class next to seniors, Ms. Marinkovich having only a one person difference between the two grades. When asked about who she would recommend the class to, Magana said, “I would to anyone who just wants to learn any skills that are important.” Magana concluded that the class was useful to students from any grade level. A recommendation of grade level was also given by Wilson, stating, “I would recommend this class to people who are worried about knowing what to do after high school, or people who don’t have a lot of support at home learning about the real world.” The class includes nine freshmen, two sophomores, three juniors and 10 seniors this year. When asked about the first round of Expeditions, Wilson said, “The first round was all about well-being, and I think I’ll hopefully be applying that throughout my life in order to be a happier person.” This provided insight on how this class originally started off. Well-being was prioritized, centering on making yourself happy and being proud of who you are. It also focused on mental health, being brave and overall fulfillment. 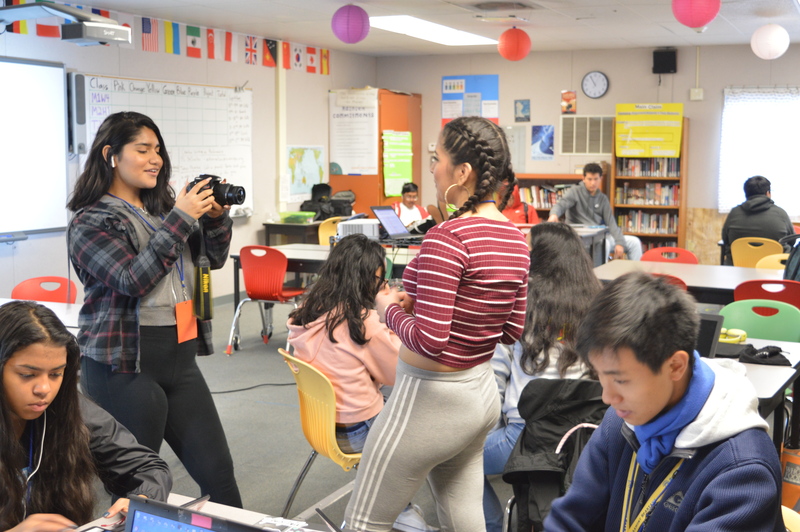 Ms. Marinkovich taught her students “power poses,” in which students pose in a way that helps them feel brave and ready before interviews and projects. 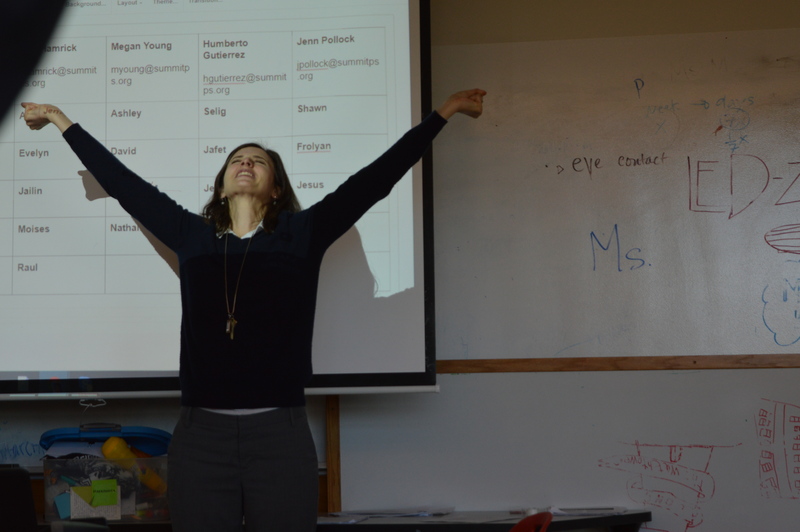 Ms. Marinkovich shows her power pose to the students before their mock interviews. Wilson explained, “This round I’m learning more about the path I want to take in college and after college.” The students at this time were designing a resume that would be reviewed by volunteers, along with searching for job opportunities. The resume lessons include learning about appropriate times to use color on resumes, fonts, formatting, unique styles, and the overall process of creating and updating a resume. Students work quietly as they prepare for a mock interview. Another lesson in the current round involved Erin L. McDermit, a volunteer speaker who came to Everest Public High School to discuss legal matters at work. She mentioned many factors that involve young adults just starting in the work field. Dating in work was mentioned and so was sexual harassment. Legal protection was a large part of the speech, including the factors that protect new workers in open employment. It was stated that you can’t be fired for illegal reasons such as race, opinion, etc. The Equal Employment Opportunity Commission and the Department of Fair Employment and Housing were two organizations that were discussed in order to raise awareness about writing complaints in a workplace. McDermit discussed situations of harassment that she experienced at work. She discussed preventative methods in order to not harass people or be harassed. After the speech ended, students went back to work on their resumes. Ms. Marinkovich explained that some of her students face unique obstacles: “The world is not a fair place we live in; for my undocumented students, a lot of things we do don’t apply to them. They’re not eligible for Social Security.” The class, however, still teaches every student these skills, no matter if they can or can’t use them.